The Indian Readership Survey 2014 is out and it shows that even in the age of Internet and mobile, the readership of physical dailies and magazines is still on the rise. Although, Internet as a news consumption medium is showing rapid growth, the physical paper still remains a popular with Indians. The Indian Readership Survey is the largest and most widely accepted platform to understand how Indian readers consume their news and through which channels. Let us look at some of the key findings of the report. According to the survey, Indian consumers are steadily growing more affluent. the lower strata of the society is decreasing, and consumers are moving up on the affluence scale. In 2014, about 24% Indian consumers owned a Two-wheeler and 22 percent owned a refrigerator. Consumers owning a PC/Laptop (9%) and Car (5%) has also seen a rapid rise. 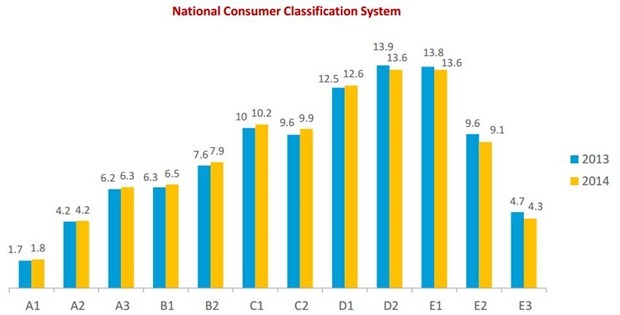 Check out this graph that shows how Indian consumers are slowly moving from bottom half to upper half. The A1 stands for maximum affluence, which E3 stands for lowest affluence. See the shift from year 2013 to year 2014. Hindi remains the most popular language for physical publications and Dainik Jagran tops the chart with a readership of over 16.6 million. Hindustan (14.7m) and Dainik Bhaskar (13.8m) round off the top 3 publications in India. Malayalam Manorama a Malayalam daily has a readership of 8.8 million, while Times of India, an English daily has a readership of 7.6 million. 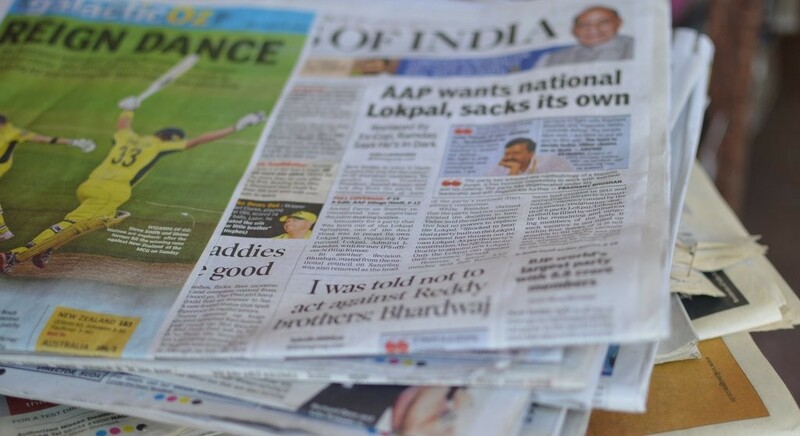 Here are the top publications in India. 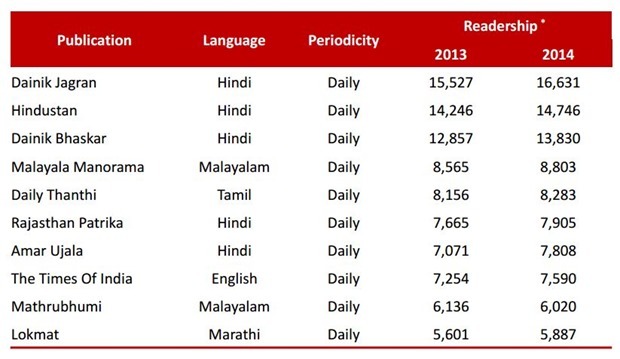 It is interesting to note that except Matrubhumi, who had slight dip in their readership all other publications have seen good growth in the number of readers. 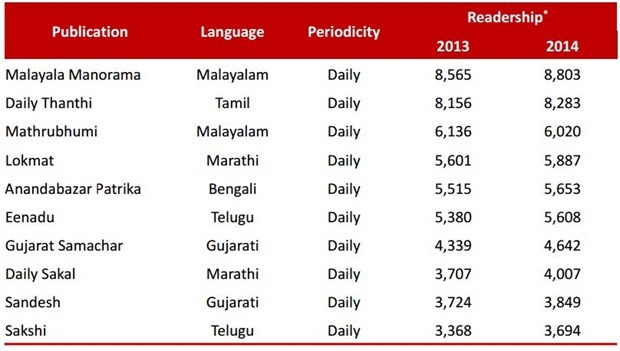 Among top local language dailies (excluding Hindi and English), Malayalam Manorama has highest readership for Malayalam, Daily Thanthi for Tamil, Lokmat for Marathi, AnandaBazar Patrika for Bengali, Eenadu for Telugu and Gujarat Samachar for Gujarati. 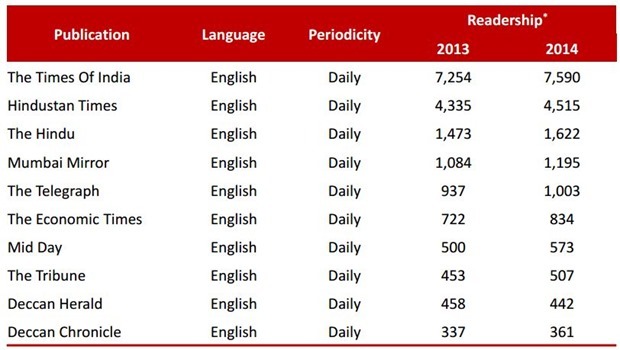 Here is the list of Top 10 language dailies in India. Times of India by all counts is not only the most read English daily newspaper in India, but also in the world. With a readership of close to 7.6 million, they are more than double of US Today, which has circulation of close to 3.5 million, also the most circulated newspaper in America. Hindustan Times, with 4.5 million readership is the 2 most circulated english newspaper in India followed by The Hindu at 1.6 million. Here too, out of the Top 10 English dailies, except for Deccan Herald, all others have been able to post positive growth. The universal growth in readership of physical newspapers show that even with onslaught of Internet and mobile devices, people still prefer reading real physical newspapers. 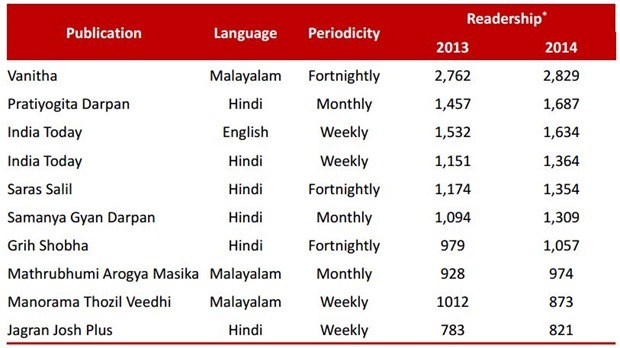 Even when it comes to magazines, local hindi is the most preferred language, with 6 out of top 10 magazines being Hindi. Vanitha, a fortnightly Malayalam magazine tops the list with readership of 2.8 million. India Today is the most read English weekly magazine with readership of 1.63 million. One of the reasons, why India is seeing surge in physical newspaper/magazine readership is because internet penetration is still not high in India, as compared to other countries. Once, that scenario changes, the demand will start becoming lower! "Dainik Jagran Remains Top Publication With 16.6M Readership , ToI Tops English Dailies: IRS", 5 out of 5 based on 1 ratings.